New York City is one of the most popular destinations in the United States for international travelers. Many backpackers head to the city to experience its energy and culture. There's so much to see in NYC that you should decide what your priorities are before you arrive. Whatever you do, there won't be a dull moment. NYC is also a notoriously expensive place to visit. If you're on a backpacker's budget, then you should head to one of the hostels around town. Most have a social environment and won't complete break the bank. A great hostel for solo travellers and groups. HI NYC Hostel is an affordable and nice hostel in New York City. It's just a few minutes from Central Park and Times Square and is in an interesting, castle style building. It's a popular option with all types of budget travelers. The hostel is part of the Hostelling International network and it is reliably clean and comfortable. There are a variety of amenities available to guests including free wi-fi, plenty of common space where you can meet other guests, a large shared kitchen, and five different banquet rooms where you can hold meetings and events. There's also a large outdoor patio where guests enjoy playing sports or holding meetings. If you've never been to New York, the staff can help you with any questions you might have. They know the city well and can tell you about all of the current activities or seasonal events that might be going on. They can also help with any transportation or tour questions you might have. There are no private rooms in the hostel, but there are a very wide variety of dorms that you can choose from. Dorms sleep between four and twelve people (and everything in between). There are also male only, female only, and co-ed dorms available. A great hostel for solo travellers and couples. American Dream Hostel is a family owned bed and breakfast in Manhattan. It's located in the historic Gramercy Park and Flatiron District neighborhood and is not far from many of the city's attractions including the Empire State Building and Union Square. Public transportation is also very convenient in the area, and there are plenty of restaurants and shops nearby. Several amenities are available to guests including a free breakfast and free wi-fi. Breakfast includes waffles, cereal, toast, fruit, coffee, orange juice, and teas. There's also a kitchen available to guests with a microwave and refrigerator. Rooms are all private and sleep one, two or three people. There are no rooms with private bathrooms, only shared. New York Budget Inn is a simple hostel that has 65 rooms. It's relatively clean and comfortable, and is a good option if you're traveling to the city and don't want to spend a lot of money. It's a five story hostel that attracts a variety of different travellers including students, tourists, backpackers, and indpendent travelers. Travelers come from around the world and it's often fun to hang out and get to know other guests. The staff at the hostel are friendly and helpful and they can help you with any travel questions you might have. It's hard to find an affordable place to stay in New York City, and this is a good and reliable option. Free breakfast is also included in the price of the room. The hostel has twin and triple private rooms as well as four bed dorms. Male only, female only, and mixed rooms are all available. 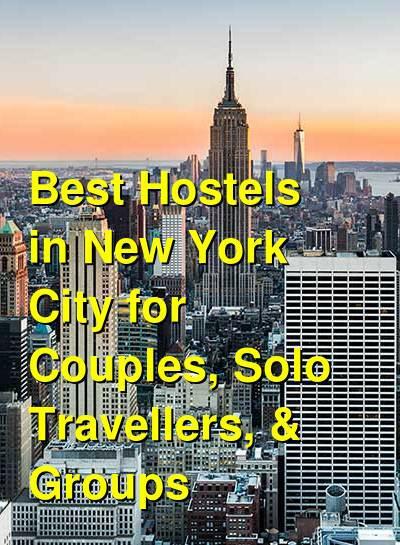 The Local is another popular hostel in New York City. It is a great place to stay with a welcoming atmosphere and friendly staff. If you're traveling alone, there is plenty of common space where you can hang out and get to know other guests. There's also a roof terrace that has great views over the city. If you need to plan the next steps of your trip, there's a computer lounge with internet access available. The staff is very helpful as well. They regularly organize events at the hostel including live concerts, comedy shows, movie nights, and beer tastings. It's a social atmosphere and a great place to base yourself during your time in NYC. Every dorm sleeps up to four people. There are no private rooms. You can choose between male only, female only, and co-ed rooms, and every room has a private bathroom.